P-En-Chants by Padmaja Iyengar-Paddy. Cyberwit.net, Allahabad. Publishing a volume of verse is like dropping a rose petal down the Grand Canyon and waiting for an echo, said Don Marquis. 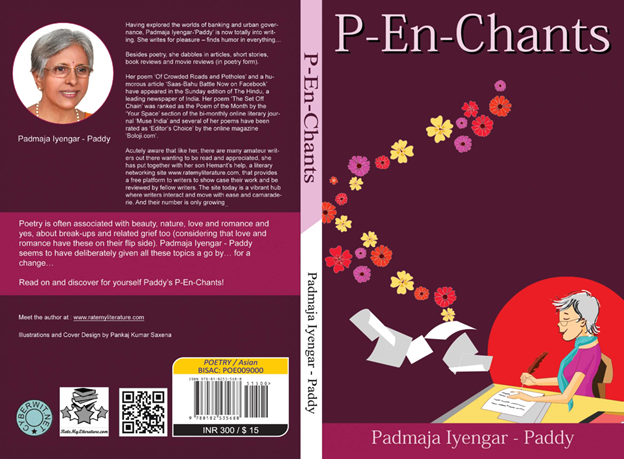 Padmaja Iyengar’s maiden volume of poetry with the exhilarating title P-En-Chants stands out with assurance and elan and makes the above adage misplace its denotation. All of us have been to the dentist some time or other, but the way the poetess explains it makes a mundane experience a memorable one in poems ‘Helplessness’ and ‘Dentistricks’. To express an experience in a memorable way is a skill to be perfected and Padmaja amply displays it. There are quite a few poems that ease your nerves in this section and I wish the readers to fully capture the thrill and enjoyment without losing the newness in a pre-read and hence cross over to the next section. Padmaja is full of gratitude to her son Hemant, who has ever been her inspiration. The conviction of the poetess here is infectious. Believing that after struggle, relief will dawn.. The fourth section ‘Some Management Mumbo Jumbo’, as the title indicates focuses on some management subjects and principles like six thinking hats, Warren Buffet Mantras, Communication, among a few others. The Poem on Risk Taking is a lesson for all times. I quote it in full. With pros and cons weighed. With plans that are well laid. Then it’s worth it all....! There are quite a lot of Movie Reviews in the fifth section including the one on Mary Kom. The last section P-En-Chants is comparatively longer with 50 poems, many of them short poems. No poet is worth their name unless they express their anguish and concern on the despicable crimes against women. The poetess has a heaving heart compassionate and considerate as is revealed in her poem ‘ Nirbhaya Lives on’. I write and that gives me euphoria. Her London experience is reflected in the poem ‘Namastey London’ , where the author wants people to exchange at least a smile or make an eye contact while they meet which will stay with both for long and bring happy surprises. Being a short one, I quote it in full. Herald a nice new dawn. As a human on this earth. A remarkable quality of the author displayed throughout this collection of poems is her sense of humour, besides deftness to handle English language, rhyming, and her acumen in handling any subjects with ease. Though many poems touch social evils and contemporary issues nailing them straight, the author has not tried to moralize or preach too much. One more notable facet I want to point out is the beautiful sketches by Pankaj Kumar Saxena which enhances the visual appeal. The enchanting cover design is also by him, which makes an instant chord with the readers. I consider myself privileged to review this unique work of Padmaja Iyengar – Paddy and I have no doubt in putting it straight that this work of hers would be an asset to our collection of books. Clothed in a language of simplicity, they go straight to the heart of the readers. Thanks very much Kulbir for reading this review and your positive words. Thank you Kulbirji and TCA Srinivasaramanujan Sir for your kind words. Thank you both Kulbir and TCA Sir, for your kind words of appreciation and encouragemnt. The excerpts are very delicious. The subtle humour in all the rhymes is beautiful. She has lived up to her reputation as a fine poet. I am proud of your achievement. May you continue to bloom and blossom, and share your wit with readers of Boloji. My gratitude. I also thank Pankajam K for taking the time to review and write such a heartwarming article. Thanks Paddy for your kind remarks. Again wishing you all success with this book and regards. Dear Pankajam. Thanks a ton for this more than generous review of my maiden poetry collection. Am completely honoured that 'P-En-Chants' has been reviewed by a poet of your stature and calibre.Thank you for making the time to read it and honouring it with your positive and encouraging review. Warm regards.